Another great weekend of Premier League football has come and gone – and we have a new bonafide Premier League title contender. Chelsea held Liverpool to a 1-1 draw to underline their potential to challenge the Reds and holders Manchester City for the crown come May. City themselves continued their unbeaten start against defiant Brighton, winning 2-0 thanks to Sergio Aguero and Raheem Sterling’s goals. 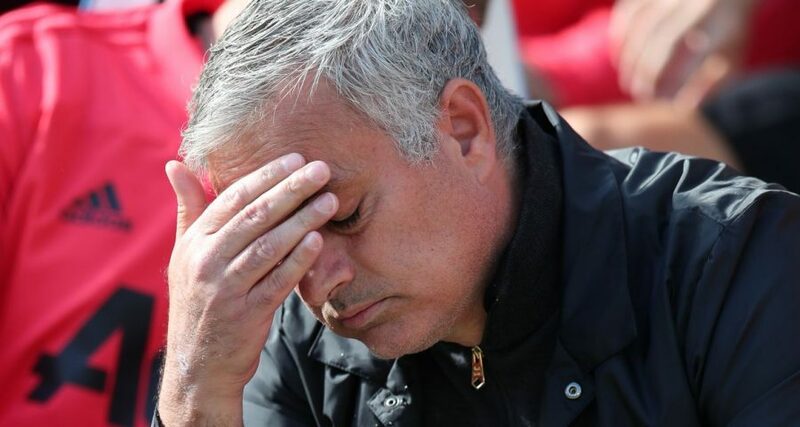 Manchester United’s title ambitions took another massive hit at the London Stadium; the Jose Mourinho sack-o-meter is wobbling towards meltdown at an alarming rate after their 3-1 defeat to rejuvenated West Ham. Elsewhere. Arsenal showed their cojones against Watford, Fulham’s Goodison Park hoodoo continued, Tottenham poured more misery on Huddersfield, Wolves beat Southampton and Burnley won their six-pointer with Cardiff. Here’s what we’re talking about after a breathless couple of days. Rather than Liverpool vs Manchester City, it is now Liverpool vs Manchester City vs Chelsea – the Premier League title race is now a three-way. Before the season, Chelsea were not considered Premier League contenders, while Liverpool were seen as Manchester City’s main challengers. The Red’s 100 per cent record was always going to fall at some point, with this the most difficult test so far, but importantly for them they are still unbeaten. They matched the Blues for much of the game but switched off at the worst possible moment to allow Hazard through for the second time this week. But you can never rule a Klopp side out, they simply keep fighting until the end. The battle at the top is hotting up nicely, with Tottenham standing ready to challenge and Arsenal bubbling along as well. There was much excitement at the prospect of a well-rested and fully-fit Alexis Sanchez hitting the ground running for United this season. With no international football for the Chilean for the first time in nine years, he was one of the few United stars to enjoy a proper summer holiday. But the former Arsenal forward – who, remember, is the highest paid player at Old Trafford – has struggled to make an impact so far, failing to find the net in five games. And Mourinho eventually ran out of patience on Saturday, making the big call to leave Sanchez out of his squad at the London Stadium. Mourinho’s explanation was that he had "options" – and picked the best team to win the game. Sanchez will hope he is involved against Valencia in midweek – and if he isn’t, it’s not looking good. Despite signing Bernd Leno in the summer, Arsenal boss Unai Emery has remained faithful to Petr Cech, at least in the Premier League. But the former Chelsea keeper looks set for an extended spell on the sidelines after pulling his hamstring in the first half. Cech looked in pain as he suffered the knock in a rather innocuous way, and he may well face a fight to win back his place. Leno has had to make do with a bit-part role since moving from Bayer Leverkusen, but if the reception he received when he came on against Watford is anything to go by, he could cement his place the hearts of the fans in the coming weeks. Only Harry Kane and Mohamed Salah have been involved in more goals since the start of last season, than Raheem Sterling. In that time he has either assisted or scored every 89 minutes, or pretty much every game. It all adds him to suggest Sterling is the most important member of Pep Guardiola’s all-conquering City side – who rolled past bus-stop Brighton with 80% possession and 851 passes in the bag. The England winger was, of course, on the scoresheet, alongside Sergio Aguero, to further boost his reputation and live up to his high statistical expectations. No player has scored more goals at the John Smith Stadium during the season and a bit Huddersfield have played their football in the Premier League than Harry Kane. The England striker netted his third and fourth strikes at the ground to go along with the brace he netted in Yorkshire last season. If that doesn’t make David Wagner break the bank to secure the goal machine…yadda yadda. Other than being a nifty, freak, stat, it highlights the Terriers’ major problem in their battle against the drop – they don’t score enough goals and they really don’t score enough goals at home. They only managed 16 goals at home last season and are yet to break their home seal this campaign – basically it is a massive problem for Wagner. Meanwhile, Kane is hitting form at the perfect time ahead of Spurs’ Champions League trip to Barcelona this week – with the north London side also sitting pretty just behind the leaders, despite their back-to-back defeats to Watford and Liverpool. It seems fairly clear that the United dressing room is not a happy place, right now. While Mourinho is perfectly entitled to speak to any of his players about their performances, doing it in front of the rest of the team, as he did with Paul Pogba, serves only to weaken his relationship with the squad. It is only natural, then, that some of the players will side with their team-mate and give the manager the cold shoulder. They will know that they are likely to out-last the Portuguese at Old Trafford and will have picked their side accordingly. The problem is, that attitude becomes apparent in the players’ performances on the field; perhaps they don’t sprint as hard as they might for a stray pass, or put their full weight behind a tackle the might come off second best in. Several of United’s players might as well have stayed on the coach in east London, including Romelu Lukaku who barely had a sniff up front. If United don’t take action, this rumbling row is going to become an earthquake before too long. Wolves continued their excellent start to the season, and had the power of their substitutes to thank for their success. Heading into the final 15 minutes, their clash with Southampton had been pretty even, and the Saints were arguably in the ascendency. But with record signing Adama Traore and Ivan Cavaleiro now back from injury, Nuno Espirito Santo has a couple of wildcards available on his bench. And that duo played their part in the opening goal which 11 minutes from time gave Wanderers an advantage they were never going to lose. Traore – ineffective until that point – raced past Ryan Bertrand and Wesley Hoedt to cross and after a smart lay-off from Raul Jimenez, Cavaleiro crashed into the roof of the net with his first touch in the Premier League. Jonny added a second late on and that was that for Wolves, who have 12 points from their opening seven games. On the pitch things are going disastrously at Newcastle, with Jamie Vardy and Harry Maguire’s goals handing Leicester a comfortable win in front of England boss Gareth Southgate. But off it, things might be starting to move in a positive direction. Mike Ashley appeared in the St James’ Park stands for the first time since May 2017 and was predictably booed and the antagonist in Magpies fans’ offensive chants. His disastrous decade at the helm looks to be teetering on the brink, though, with former Manchester United and Chelsea chief Peter Kenton in the process of raising cash for a £350m buyout. The positivity in the north east needs to come soon, though, with Newcastle heading for the Championship at a rapid rate, with no wins from their opening seven fixtures. Everton’s urgency to muscle their way into the Premier League’s elite has been underscored in recent years by a series of rash managerial appointments. After four games without a win, some were even beginning to grumble about Goodison’s current incumbent, Marco Silva. But his side’s second-half performance against Fulham suggested Silva and Everton could belatedly be on the right track towards attaining the kind of status they understandably crave. Meanwhile, the Cottagers have still never won at Goodison Park and are on a 22-match losing streak there. Burnley took the spoils in the first real relegation six-pointer of the season – and picked up their first win at the same time. It begs the question. Where are Cardiff going to pickup enough points to retain their Premier League status for a second successive season? The Bluebirds face Tottenham, Fulham and Liverpool in their next three fixtures and the wise betting man would be banking on them to remain winless. Dark times in south Wales.